The TMF300x series from Taicom have been designed to provide an array of mating options in both wire-to-wire and wire-to-board applications. The single row TMF3001 series & dual row TMF3002 series are both industry compatible connectors in a standard 3mm pitch. The single row TMF3001 series offers a wire-to-wire option along with a vertical PCB header for wire-to-board connections. The dual row TMF3002 offers the same options as the single row series but also includes a right-angled option, the PCB headers are available in both straight and right-angled variations and have a surface mount option making the TMF300x series an all-round versatile connector system. All parts in the TMF300x series are rated up to 5A/250V making them suitable for power applications. The crimp housings feature a latch in the centre of the moulding which securely locks on to the ramp of the headers, this gives the connectors a secure lock when mated together allowing them to be used in applications where the possibility of vibration or shock may exist. The TMF300x series connectors adopt the same standard keying system used on other industry compatible connectors to prevent incorrect mating. The single row TMF3001 series are available from 2 through to 12 positions and the TMF3002 series dual row from 2 through to 24 positions. All popular positions are available from stock on Anglia Live or by calling the Anglia office. The TMF300x series have two crimp terminal size options available allowing them to be used with wire size 20-24AWG or 26-30AWG. These terminal options are available for both the male and female crimps and they come packaged on reels compatible with automated crimping machines or can also be supplied loose for use with manual hand tools TCT002 & TCT003 allowing for prototyping or small production runs without the need for fully automated equipment. The TMF300x series are manufactured using high quality Nylon material which is flame retardant to UL94V-0 making the connectors ideal for applications where end equipment requires third party safety approvals. The connectors have an operating temperature range from -25°C to +85°C. Taicom employ efficient lean manufacturing techniques and high levels of automation throughout all of their product facilities, this allows them to offer reliable and consistent quality connectors with very competitive pricing. Taicom also manufacture other high-quality industry compatible connectors with competitive pricing, visit www.anglia-live.com/manufacturer/TAICOM to browse the range or type a competitor part number into the Anglia Live search bar to find a Taicom alternative to many industry standard connectors. 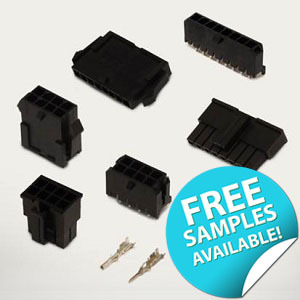 Anglia are offering customers FREE samples of the TMF300x series 3mm pitch wire-to-board and wire-to-wire connectors from Taicom, please fill in the form below to register for your FREE samples now.